Compare discounts for Hotels Motels in Anchorage, Alaska! Anchorage, the largest city in Alaska, is home to almost half of the people living in this great wide-open frontier. With a diverse cosmopolitan population, high-rise office buildings and brand name retail stores, Anchorage is much more modern and 'American' than most people would expect. Major points of interest in Anchorage itself include the Anchorage Museum of History and Art, the Alaska Native Heritage Center, the Oscar Anderson House and the Alaska Experience Center, all of which focus on either the history or the natural beauty of Alaska. 37 miles south of Anchorage is the Alyeska Resort in Girdwood - Alaska's largest winter sports complex. It offers excellent ski runs as well as magnificent views from the top of Mount Alyeska. Most of the other major attractions in Alaska are within a few hours drive of Anchorage including Denali National Park, Katmai National Park and Portage Glacier. Hotels in Anchorage are mainly located in two clusters � in downtown Anchorage and near the Anchorage International Airport, 2 miles to the south of downtown. Note: Lists are not identical. 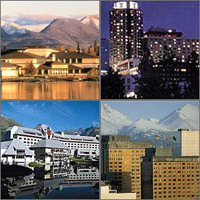 Different sites offer different accommodation options for Anchorage. The Hotel Captain Cook is located 6 miles from Anchorage International Airport in downtown Anchorage. The Alyeska Prince Hotel and Resort, Alaska's only AAA four diamond hotel, is located just 40 miles south of the Anchorage Airport along the scenic Seward Highway. The Anchorage Marriott Downtown is conveniently located four blocks from the convention center and within walking distance of many businesses and cultural attractions. The Millennium Alaskan Hotel Anchorage is located one mile from Anchorage International Airport and 10 minutes from downtown Anchorage, on the eastern shore of Lake Spenard, one mile from Anchorage International Airport and four miles from downtown Anchorage. The Hilton Anchorage is a high-rise hotel located in the heart of downtown Anchorage. The Westmark Anchorage Hotel is located adjacent to the Egan Convention Center and the Alaska Center for the Performing Arts, within blocks of restaurants and shopping. The Sheraton Anchorage Hotel is a 16-story hotel located in downtown Anchorage, just 15 minutes from Anchorage International Airport. Its central location provides easy access to Anchorage's busiest shopping centers and the most popular events and meetings venues. The Anchorage Dimond Center Hotel is a new hotel opened in 2002, next to the Dimond Center shopping complex, 6 miles south downtown Anchorage. The Coast International Inn is located 10 minutes from downtown Anchorage and 2 minutes from the Ted Stevens International Airport. The Historic Anchorage Hotel, listed on the National Register of Historic Places, is a boutique hotel located in the heart of beautiful downtown Anchorage. Inlet Tower Hotel and Suites offers spectacular views of Sleeping lady, the Chugach mountains, Anchorage downtown skyline and Cook Inlet. The Hilton Garden Inn Anchorage is located in the heart of midtown Anchorage, 3 miles from Ted Stevens International Airport, downtown and Egan Convention Center. The Howard Johnson Anchorage is located downtown, within walking distance to the Eagan Convention Center, the Fifth Avenue Mall, the Center for Performing Arts and is only 7 miles from the Anchorage International Airport. The Hampton Inn Anchorage is located five minutes from the heart of downtown and a short drive to the airport. The Best Western Barratt Inn is a family owned hotel located only minutes away from Anchorage Airport, shops, galleries, fine restaurants, theaters and boutiques.